To understand why virtualized environments require a new approach to switching, read the WHY-OVS document that is distributed with the source code. 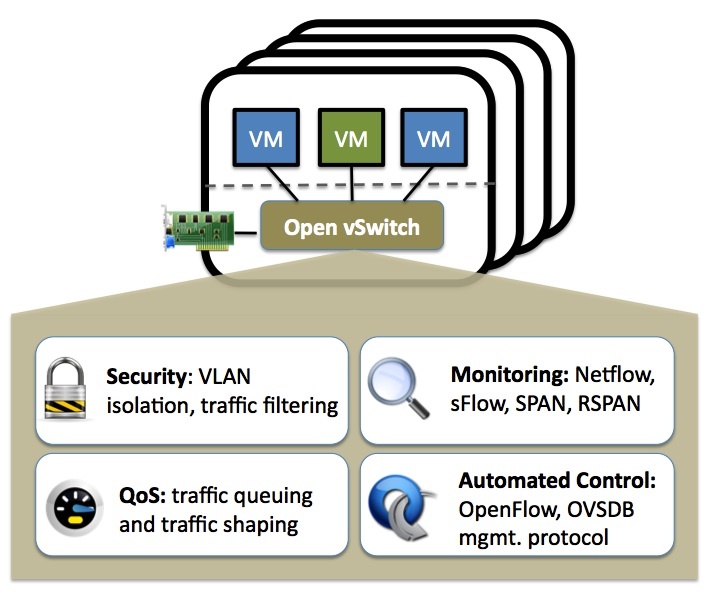 Open vSwitch is used in multiple products and runs in many large production environments (some very, very large). Each stable release is run through a regression suite of hundreds of system-level tests and thousands of unit tests. In addition to OVS, the Open vSwitch community maintains the OVN project. OVN complements the existing capabilities of OVS to add native support for virtual network abstractions, such as virtual L2 and L3 overlays and security groups. Open vSwitch Fall Conference 2018 was held Dec. 5 and 6 in San Jose. You can view the slides and videos. Open vSwitch can operate both as a soft switch running within the hypervisor, and as the control stack for switching silicon. It has been ported to multiple virtualization platforms and switching chipsets. It is the default switch in XenServer 6.0, the Xen Cloud Platform and also supports Xen, KVM, Proxmox VE and VirtualBox. It has also been integrated into many virtual management systems including OpenStack, openQRM, OpenNebula and oVirt. The kernel datapath is distributed with Linux, and packages are available for Ubuntu, Debian, Fedora and openSUSE. Open vSwitch is also supported on FreeBSD and NetBSD. The Open vSwitch release in development has been ported to DPDK.